Exception encountered: Cannot determine a product license to use. This suggested to me that I needed to set the environment variable ADSK_COMPOSITE_LICENSE to Softimage, and that did the trick (when I checked, that environment variable was set to 3DSMAXDESIGN, and that’s why Composite was silently failing). As a bonus, I also found the Composite Licensing log file %LOCALAPPDATA%\Temp\toxik\adlm.Composite.2013.log. The log entries make me think that my Runtime Error was caused by a Product Information (PIT) file problem. 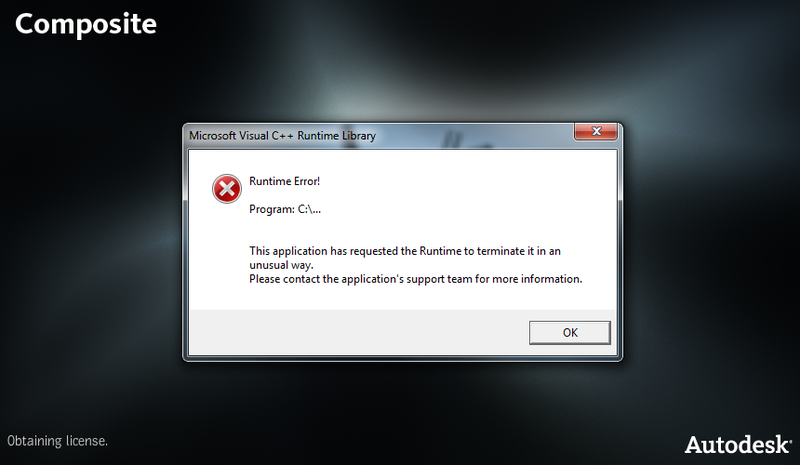 That’s why installing Composite 2013 SP1 fixed the problem.